We need you and you need to make a difference for the betterment of our planet's ocean and our children's future. 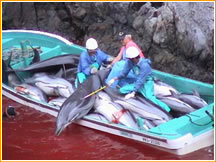 The daily dolphin slaughter in Taiji, Japan represents the single largest killing of marine mammals in the world. Off the coast of Japan in a difficult to reach and view cove, Japanese fisherman kill more than 20,000 dolphins and porpoises every year. Much of the dolphin and porpoise meat contains toxic levels of mercury, however, is often labeled as whale meat and sold as food in Japan and throughout Asia. While known by locals and insiders for years, the daily slaughter was brought to the public view in 2009 by a team of highly trained activists and conservationist Ric O'Barry in the film The Cove. In addition to receiving numerous documentory awards including a 2009 Sundance Film Festival Award and a 2010 Academy Award, the film has created international groundswell support to eliminate the dolphin slaughter. Visit THE COVE Movie website. Watch the movie and let the experience move you. Then visit the Cove blog, which includes social media updates, RSS feeds, petition forms and a Take Action sign up. Finally, visit SaveJapanDolphins.org to educate yourself and help get the word out. Consider signing the petition to President Obama, the Japanese Ambassador to the United States and other influential people who can act to stop the senseless killing of marine mammals. Vantive supports The Cove mission and encourages other concerned individuals to do the same. There's no substitute for rolling up your sleeves and working with the people who can make a difference. They get the benefit of your participation and you gain a direct understanding of the real problems and potential solutions, which makes you a more informed giver.